Robert Ford addressed some Syrian traitors in Berkeley, Michigan, back in July of 2012 after he was booted out of Syria. If you all remember, he was the U.S. “ambassador” to Damascus whose legacy will surely be that he participated in the evolution of the war there by openly fomenting discord in that nation and visiting known enemies of the state, especially in Hama and Homs. He performed these positively unlawful acts under the noses of the Syrian intelligence services who seemed to be taking their orders directly from President Assad. Assad was extremely confident at the time that his country would never go the route of the utterly mislabeled “Arab Spring”. So confident was he that it appeared he was taunting the criminal Ford and his ever-present sidekick, the wino-French ambassador, Eric Chevalier. Dr. Assad did not know at the time that the U.S.had plans for his ouster back as far as 2007 and that the disturbances in the Arab World were merely the setting up of the proper scenario for exactly that outcome. Ford, described invariably in SyrPer as a common criminal and imbecile, appeared before that group of mostly Muslim Brotherhood supporters and promised them the end of “Assad’s Reign”. He mumbled a few words in mispronounced Arabic and told the cheering crowd that there would no longer be any more “Makhloof, Assad or Shaleesh”. I was given a heads-up about the speech by a good friend who had ties to the traitors who would be the majority in attendance. I tried to get many of my fellow Syrians to attend with me and my wife but could only secure the accompaniment of John Esq. We entered the den of the rats like some Daniel dipping his toe in a sewer. When Ford had finished his speech and John Esq.devastated him with a question about how Abraham Lincoln fought his Civil War with the South killing over 800,000 people and Ford reacting with the lamest answer I have ever heard, Ziad left with his wife and shouted over the bellowings of the mostly Sunni crowd: “Our president will still be in office after yours has returned to his cesspool in Chicago.” I was right, except about where Obama would return. Ford has experienced an epiphany. He was interviewed by the Saudi-owned, London-based rag “Al-Sharq Al-Awsat” and told the interviewer that “Assad has triumphed”. He also stated that Russian FM Sergei Lavrov treated U.S. Secretary of State, John Kerry, like a “child”. He also chided Obama for leaving the Trump regime with “few options” and predicted that Dr. Assad would reunite his country “sooner or later”. He also warned the Kurds about the tragic mistake they were making in trusting the U.S. Ford should be tried as a war criminal for his acts in pushing Syria toward this horrible war. Robert Ford seen here trying to avoid the stench of Syrian traitors and child molesters who dreamed they could overthrow the Ba’ath Party and Dr. Assad. But, you know, in penitence there is redemption. As Ford laments his sordid history of murder and mayhem, he can take solace in the fact that he still might finagle a painless death on this earth. He might still cheat the wishes of every loyal Syrian citizen who has had to live with the aftermath of his folly-ridden crusade to bring Syria down in ashes. And what of Trump? Why, Trump, who appointed his son’s wedding planner to the position of Secretary of Housing and Urban Development, is so far at sea his advisors hold security meetings without him. He has defaulted on every issue and has ceded decision-making to the wolves, weasels and Zio-Nazis who infest his “regime”. And as Saudi Arabia verges on total anarchy, the former vice-heir now the only heir to the throne of the vultures, continues to arrest members of the “royal” family insuring his expeditious descent into the same abyss waiting for Mr. Trump. #ISIS have blown up Al-Nuri mosque and completely destroyed its minaret in #Mosul Old city. #ISIS knew that their caliphate have been completely wiped out at the hands of the #Iraqi forces and didn’t want give the mosque up. #Iraq Counter Terrorism units were 50 meters away from Al-Nuri mosque, when #ISIS detonated it. It seems the new French regime has shifted policy toward Syria, we will see whether this statement endures more than 24 hrs, it would be a record for France to sustain such a statement that long, Hollande and Sarkozy did not. Our French Syper fellows could give us mush more details on this new development, much appreciated for that. It’s “off topic” but I was often reading/posting on iranmilitaryforum.net (during years), but I have no idea why the administrators haven’t decided to recreate the site elsewhere, any idea? Thank you Ziad and all other Sypers for the very useful supply of information that keeps me cheerful Your command of English is staggering good and word-smithing highly amusing. I only hope the great Satan of America US/Uk don’t manage to pull something out of the bag. Victory to Syria, kudos to her brave fighters. Amazing – An extraordinary concept of self as related to justice and war-crime, that ‘men’ like Ford and Bush, Negroponte, Clinton ->the entire ‘etal’ neoconazionist swamp; can hands-on create mayhem at these extreme levels, then consider such murder an “oops…my bad” after loss, and the carnage is done. Gee, I offer positive criticism, provide evidence to support my assertion, my comment gets initially posted, but when I return to see if it’s garnered any responses, I find it’s been censored. Disappointing is a tactful expression explaining my reaction. The SAA will batter IS to death. The Kurds will see reason. The Americans will wonder why everyone hates them. yeah i saw the article about this on AMN,funny enough all the commenter’s were cheering this sob on,,i guess little did they know about his dirty past involvement in the rise of this war ,are all these bastards now trying to jump ship in some form of grace? An important Video .. to make viral.. about Syrian war. What this war brought against the Syrian people and made even sicker is that somewhere some sharp pencil with a calculator totaled up the costs, benefits and profits in attacking the Syrian nation and the good people of Syria didn’t even figure into that mathematical exercise. How those like Ford, the hit men that carry out such plans, sleep at night is beyond human capacity to understand, but sleep they do. No doubt Ford knows what he deserves but still he and his family carry on living a pampered lifestyle while crying his crocodile tears. The agenda of the Kurds, ISIS and Al Queda can be clearly seen from the numbers. over 5 million internally displaced syrians in gov areas. What General Z and his brave men have to face everyday all day.. Crazed Zombies who think they are dead but aint just yet. 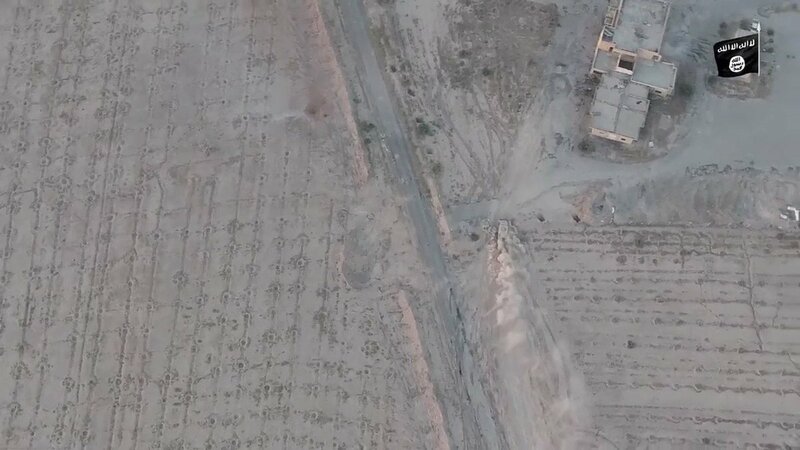 IS tried to repeat the Tabqa scenario with the Syrian army yesterday in West Raqqa by severing supply routes. Did not work our and their corpses litter the battlefield along the Khanasser Ithriya Road. Guess the fight between Qatar and Saudi Arabia is SERIOUS…At the end of the meeting. FSA & Saudi crown Prince agreed to work together w/ Jordan to clean up Daraa from terrorists. These criminally insane corrupt elites WILL PRETEND to be all friendly and peaceful. Then they will organize a FALSE FLAG event and claim “they are forced to invade Syria”. Just another plan with the same goal: destroy Hezbollah and a war on Iran. The Zio-Joos are reeling from the after-effects of the Iranian missle strike (real target Israhell and Saudi Rapeya) against ISIS in Syria and now, to try and allay the fears of their Tay Sachs carrying populace are making bold, brazen threats against..get this…Lebanese civilians, not just Hezbollah. Kadyrov Foundation to restore the oldest Umayyad mosque in Aleppo. like to see Ziad personally engage with current politician & see if they can at least try to engage in positive American/Syrian relationship going forward. When I met the Prime Minister of Rojava, about one year ago, he told me exactly the same. He said that they don’t have good relations with Damascus, but they have some relations, because they don’t want to break the negotiations, to obtain federalism. He told me that if they would break the relationship, the regime would cut the salary for civil workers, hospitals and so on… They’re still in Syria, he said. Syria under attack for allying with iran & russia while iran & Russia do nothing to protect Syria’s airspace. Russia is weak. US allies always safe & protected Russian only condemns attacks on syria. Should it be agreed upon all, the whole area below cease to have war. Huge. 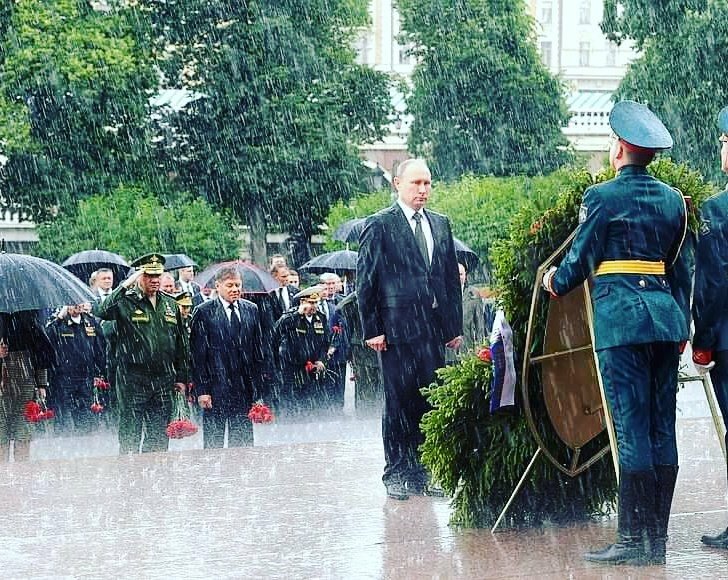 Putin braves rain to honor WWII victims at Tomb of the Unknown Soldier. The President honoring the men who fell in battle. Well, well, well! The truth finally comes out now. It seems that our poor little US college student imprisoned in North Korea for a over a year was…………Jewish! He even belonged to Hillel on campus and had made trips to Israel! This comes from a Gilad Atzmon article just published today on VT! Funny how no mention of his religious-ethnic background was never made public before. Gotta’ love those North Koreans though! They don’t f*ck around! Ahrar al Sham are adopting the three stars into its logo, and rallying groups to attack HTS. While the cat is away, the mice do play. 1) The SAA will focus on beating up IS in the coming months. 2) When they get back to Idlib, there will be no Al Nusra, but a freshly minted moderate opposition called Ahrar al Sham. SOUTHFRONT: IRANIAN MEDIA IS CLAIMING 18 ISRAELI FIGHTER JETS ARE IN SAUDI TO PREVENT ANY POSSIBLE COUP.